A wireless network diagram is a specialized type of computer network diagrams. A wireless network uses wireless data connections to connect devices such as laptops to the Internet and to the business network and its applications. 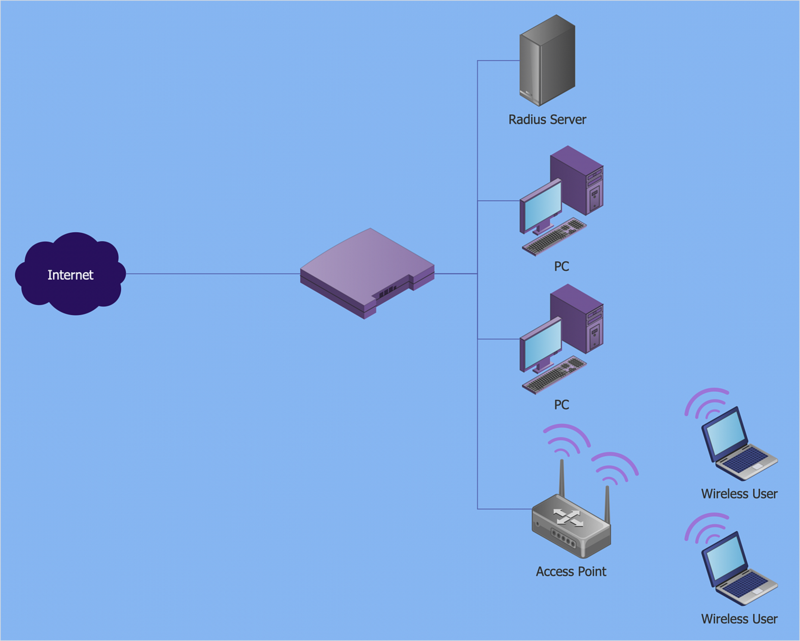 Wireless network diagrams are used to represent components of the wireless network: how they are connected and how they interact with end-users. The ability to create wireless network diagrams is contained in the Wireless Networks solution. This solution extends ConceptDraw DIAGRAM with a library that contains about 80 vector shapes that can be used when drawing various types of wireless network diagrams. Reveal the Wireless Network Diagrams in the Solutions panel. Open the Wireless Networks library. Add the wireless network elements to the diagram. Use Clone tool to quickly add copies of the selected library object. Connect objects using the Smart Connector tool . Just drag the connector from one connect dot to another. Result: The Wireless network diagram represents clearly a home or office wireless network structure. It is indispensable for the development, operation, and maintenance of the WLAN system of any size and complexity.